Menulog delivers for Gursha Ethiopian Restaurant so you'll be able to track your courier on a map. Toasted injera (Ethiopian flat bread) with herb butter and mild red pepper. Chickpeas, onion, garlic, green chilli and parsley. Minced beef or lentils, with red onions, celery, green chilli and wrapped in pastry. Fava beans cooked with garlic, topped with fresh tomato onion, green chilli, cumin and feta cheese. Served with mountain bread and your choice of egg or falafel. Cracked wheat (bulgun) cooked and with herb spiced butter (kebe). Piece of freshly pan baked flat bread seasoned with spiced butter (kebe) and berbere (traditional chilli). Scrambled egg with tomato, onion, green chilli and butter (kebe). Spicaly prepped injera slightly cooked and tossed in fried beef stew. 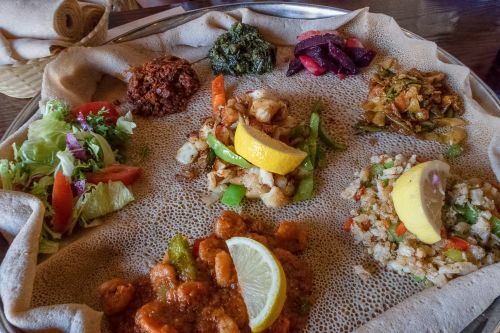 All traditional mains are served with injera (Ethiopian flat bread). Traditionally made chicken drumstick stewed in red pepper sauce with assorted Ethiopian spices and herbs. Tender lean beef cooked in red pepper sauce seasoned with Ethiopian spices and herbs. Tender lean beef simmered with turmeric, garlic, onion, fresh green chillies and ginger. Pieces of injera mixed in sauce with strips of beef, onions and green chillies. Tender beef sautéed with rosemary, onion and green pepper. Served hot or mild red pepper sauce. Ground peas and beef seasoned with garlic and onions. Prepared in spiced butter (kebe). Finely chopped lean beef raw, medium or rare cooked with spiced butter (kebe) and mitmita (hot spiced chillies). Finely chopped lean beef raw, medium or rare cooked with spiced butter (kebe) and mitmita (hot spiced chillies) - Served with Aybe (cottage cheese), Aybe besega (cottage cheese mixed with chopped lean beef) and chopped gomen(kale). Doro Wot, Siga Wot and Alicha Wot. Meat : Yedoro Wot, Siga Wot and Alicha Wot. Vegetables: Hot Misir Wot, Shiro, Ye-Ater Alicha and Ye-Atklet Wot. Doro Wot, Siga Wot, Alicha Wot, Kitfo, Tibs and Aybe Bessega. 100% Vegan. Served with injera. Steamed peas with onions, seasoned with garlic and ginger. Cabbage, potato and carrot cooked with Ethiopian blend of herbs and spices. Red lentils stew in berbere (Ethiopian red pepper) and other fresh herbs. Split peas puree cooked with onion, garlic and traditional spices. A combination of Ethiopian vegetarian dishes. Salad, onion, green chilli, cucumber, tomato and spread mayonnaise. Fried rice with chicken or beef. Fine minced beef, onion, garlic and Ethiopian berbere cooked in spicy tomato sauce. Lamb and okra stew in red pepper served with rice or injera. Sudanese dish. Cooked onion, garlic, tomato, cumin, coriander and black pepper. Lettuce, tomato, onion, green chilli, garlic and cucumber. Beetroot, onion, garlic, green chilli, with spices and olive oil. Green onion finely chopped, green chilli pepper devised with peanut butter, lemon juice and topped fresh parsley.